Also I see signs on the side of the runway pointing to those markers. The first one is the holding position marking. It denotes the entrance from the taxiway into the runway. The dashed lines are in the side of the runway. The second one is the non movement area boundary mainly for vehicles, which divides the movement and non-movement areas of boundary- the movement area is on the dashed line, for moving into which you'll need ATC clearance. Your first example is a runway hold. That is the physical boundary of the runway. The second is a non-movement area boundary. This is the the boundary of where ATC controls. For example, they may park the snow plows beyond this boundary. When they plow crosses the boundary, it needs to be in radio contact with the ground controller in the tower. 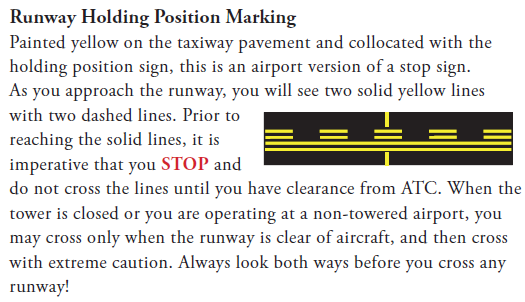 As mins said in his comment, it's a "holding position" marking; it denotes the entrance to runway from a taxiway. It's like the solid white line at a traffic light, except that pilots don't usually roll over it while waiting to be cleared onto the runway (waiting for the light to go green). The sign you saw is a "Runway Safety Area / OFZ and Runway Approach Area Boundary". It is on the side of a sign pilots will see when exiting an RSA (Runway Safety Area) or OFZ (Obstacle Free Zone). Here's a reference of the various airport markings. Not the answer you're looking for? 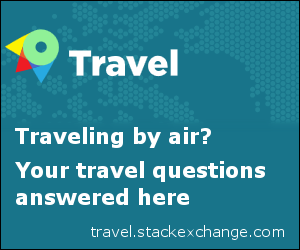 Browse other questions tagged runways airport-markings or ask your own question. What are these markings on the runway at Haneda Airport?